" last of the lightbulbs "
description : One light-bulb burns, the other light-bulbs function as a lampshade, diffusing and spreading the light. The burning bulb will light up the other bulbs. When the bulb is burned out: simply screw the lamp-holder on to an other bulb. Part of the design-collection of: “DESIGN MUSEUM GENT” in Belgium. 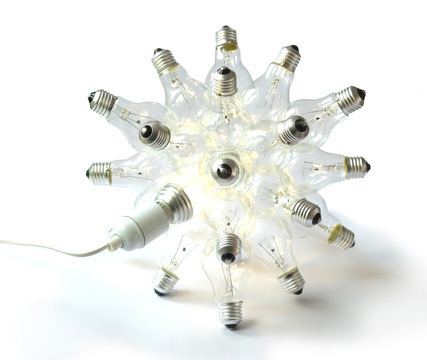 Because of the new guidelines for light-bulbs, "SPARE" is re-designed for the future: build with 25 classic clear light-bulbs and 1 clear LED-bulb that looks just like a classic bulb. 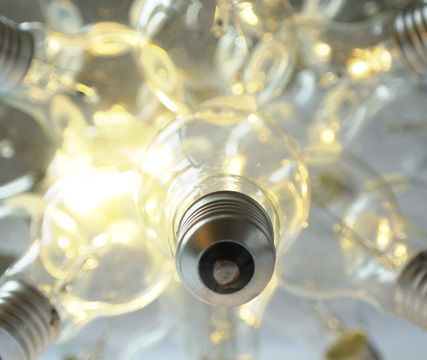 Now you can choose to let a classic bulb or a LED-bulb burn. After +/- 40 years all the bulbs are burned up. 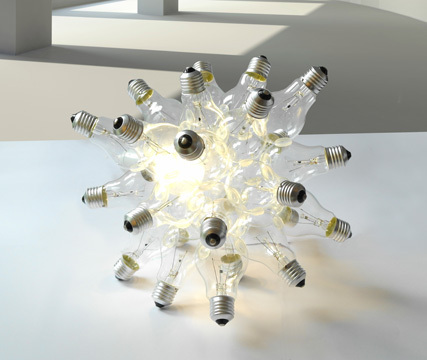 In a few years,when there are no regular bulbs left anywhere, you will still enjoy the light of your "SPARE" bulbs. dimensions: 26x26x26 cm. / 10,2x10,2x10,2 inch.